Reliable five-year-old Mossailey had to fight hard but managed to post the fourth win of his career in the Kilmore Cricket Club Benchmark 72 Handicap (1907m) at Kilmore. Mossailey has been a model of consistency for Edwards Elkington Racing, only finishing outside the first five six times in 20 starts before his latest success. Mossailey went into the race in solid form with minor placings at his previous two starts, including a last-start second at Wangaratta that convinced trainers Jamie Edwards and Bruce Elkington to step him up to Benchmark 72 company at Kilmore. Ryan Maloney stuck with the son of Mossman in the $15,000 test. The jockey sent Mossailey forward to track the leader Richoman early in the race but was content not to contest the lead. Richoman had everything his way for most of the race, providing Mossailey with a stiff test if he was to reel him in once Maloney asked him for an effort from the 500 metres. Mossailey got up outside Richoman at the 400 metres but the front-runner refused to wilt, forcing Mossailey to dig deep in the straight. However, Mossailey was up to the challenge, getting the better of Richoman under Maloney’s urgings to win by a nose. Richoman’s jockey Craig Newitt unsuccessfully, leaving Mossailey’s connections to enjoy their latest success. Mossailey’s win earned him a $9,000 winner’s cheque taking his stakes tally to more than $42,000. Congratulations to Mossailey’s owners - Mr C I Brown, Mr W J Morgans, Mrs M A Pearson, Mr C S Tognolini, Miss Y E Hickenbotham, And Hooray At Last Syndicate - Peter & Christine Sandars, Grant & Angela Sandars and Darren & Lisa Sandars. 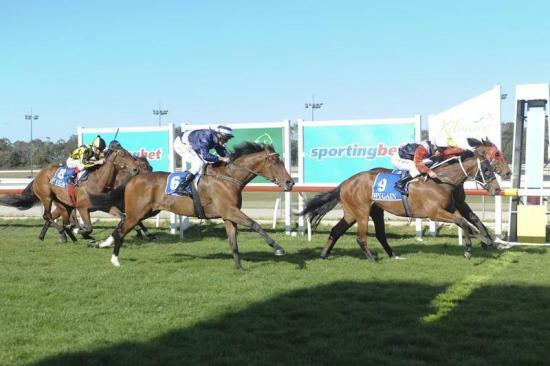 Click here for a replay of Mossailey’s brave win at Kilmore.